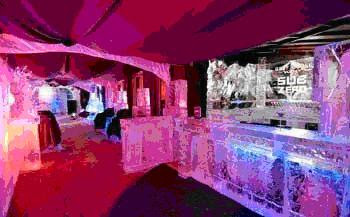 Is there no stopping the nightlife scourge known as the ice bar? Apparently not. Sub Zero — actually its full name is “Grey Goose Sub Zero,” in honor of the sponsoring vodka — is perched atop Montreal’s Hotel Place d’Armes. Sub Zero gives new meaning to the phrase “on the rocks.” Drinks are served in fist-sized hollow ice cubes, and the barmaid plunks them down on a bar made of clear ice blocks. The space is kept at -1 centigrade, and all the usual ice-crap is on offer: ice furniture, ice glasses, the bar’s made of ice, various ice sculptures, the walls and tables are also built with ice!